Mattel and Nickelodeon Form U.S. Television and Consumer Products Partnership for Thomas & Friends™ | Mattel Inc.
EL SEGUNDO, Calif., Jan. 25, 2018 -- Mattel, Inc., a global learning, development and play company and Nickelodeon, the number-one entertainment brand for kids, today announced a new U.S. television and consumer products partnership for preschool favorite, Thomas & Friends. 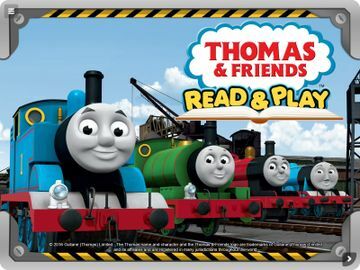 The partnership will include the launch of the brand-new seasons of Thomas & Friends on the Nick Jr. channel, as well as additional specials that will air on Nickelodeon throughout the year. Nickelodeon will also become Mattel's exclusive U.S. consumer products agent for Thomas & Friends across multiple merchandise categories including apparel, accessories, home goods, consumer electronics, and more. "Securing Nick Jr. as our new home for Thomas & Friends is a huge game changer for the brand franchise, and one that, alongside our reimagined content direction will enable us to captivate new audiences as well as deepen engagement with our existing fans in the US," said Kate Schlomann, VP & Global Brand GM, Thomas & Friends. "The brand is undergoing a huge evolution to ensure that it remains relevant & competitive for today's audiences. We are taking Thomas off Sodor for the first time in our episodic series, evolving our storytelling to be more inclusive, meaningful and entertaining which will strengthen our brand franchise. We are thrilled to have Nick Jr. as our partner as we bring the world into a child's home through the eyes of Thomas & Friends." "Thomas & Friends' iconic characters and engaging stories have resonated with kids for decades and we believe the new seasons will be a great complement to Nickelodeon's curriculum-driven preschool programming," said Pam Kaufman, Chief Marketing Officer and President, Nickelodeon Consumer Products. "We look forward to working with licensing partners to capture the spirit of Thomas through fresh, innovative products that inspire kids to live out their own adventures through play." The new season (season 21, 11 half-hour episodes) of Thomas & Friends will debut weekdays in March on the Nick Jr. channel, and full-length episodes and short-form content will also be available on NickJr.com and the Nick Jr. App. In addition, movie specials will air on Nickelodeon throughout the year, including the world premiere of Thomas & Friends: Big World! Big Adventures! The Movie (1 x 80'). The movie includes newly revamped content that will appear in season 22 of the franchise, premiering this fall. Thomas & Friends: Big World! Big Adventures! (season 22, 13 half-hour episodes) had its first screening at the recent 2017 MIP Junior World Premiere TV Screening to much critical acclaim. Season 22, follows the world's No.1 blue engine as he takes kids on a journey of wonder and curiosity around the world to discover & experience new countries, learn about other cultures and of course, make new friends along the way! In addition to Thomas' expanded adventures, several aspects of the show were evolved to appeal to contemporary viewers, including: an all-new format series, faster-paced plots, increase in humor, and more action and adventure-based storylines with several new fantasy and musical elements. For the first time ever, Thomas will also be breaking the forth wall and speaking directly to the viewer. Thomas the Tank Engine™ was originally created over 70 years ago by the Rev W Awdry, as a storybook for his son. That story quickly grew to become the award-winning global brand franchise it is today, enjoyed by families around the world across multiple touch-points and formats, including; toys, apps; consumer products; publishing; live attractions and much more. Thomas & Friends is aired in over 160 territories, in over 50 languages with over 1.16 billion lifetime views on YouTube, and offers more than 80 hours of original content produced from 500 episodes and 12 specials. Michelle Chidoni – VP, Brand Comms. Thomas the Tank Engine™ was created over 70 years ago, by a British clergyman, the Rev W Awdry, as a storybook for his son. That story quickly grew to become the award-winning global brand franchise it is today, enjoyed by families in more than 160 territories and over 55 languages across multiple touch-points and formats, including: 500+ original TV shows; 12 feature-length films; 20 websites in 12 languages; apps; toys; consumer products; publishing; live attractions and much more. Thomas & Friends has earned numerous prestigious accolades including, a Parent's Choice Award, a Webby and a Licensing Award for Best Classic Licensed Property. Thomas & Friends™ is viewable on more than 30 world-class broadcasters including Nick Jr. in the US, Super RTL in Germany, and on Five's Milkshake! and Nick Jr. in the UK. Thomas & Friends can also be viewed across digital platforms including Hulu, iTunes, YouTube and more. On YouTube, the Thomas & Friends channel has had over 1.16 billion lifetime views, over 909k subscribers and 2.6MM engagements. For more information about the world of Thomas & Friends, please visit www.thomasandfriends.com and facebook.com/thomasandfriends.